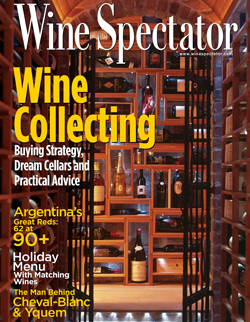 Collectors go underground to store their wines. Caves are great for California hills, but what about city folk back East? New Jersey chiropractor John Bomhoff craved a cave, but lacked a hillside. Enter Michael Zuehl of Distinctive Environments in Lake Forest, Calif., who is willing to work anywhere in the country. Certain that an architectural cave could be constructed in Bomhoff's basement, Zuehl invited Bomhoff and his wife, Joanne, to travel to Napa Valley and visit winery caves. "Among the many wineries we visited, the one that Mike particularly wanted us to see was Rutherford Hill," Joanne says. "The guide opened the two enormous wooden doors leading to the wine tunnels, and John and I immediately felt the walls, turned to Mike and said, 'This is exactly what we want.' All of our ideas came together after walking through those doors." Zuehl used gunite (similar to shotcrete, but dry until application) to transform an area of the couple's unfinished basement into a two-chamber cave. Guests entering the cave go from a small entrance to a 300-square-foot cavern, the illusion being that they've stepped into the earth. A waterfall trickles through a virtually invisible tempered glass panel that separates the cellaring and tasting chambers and their two climates. Bottles purchased during the Bomhoffs' Napa Valley trip, including Rutherford Hill Episode Napa Valley 2001, and wines from trips to New York wineries such as Brotherhood and Warwick Valley fill the 900-bottle-capacity racking system that wraps around the cellar's walls. "In the past, many cellars were built for the sole purpose of housing and cellaring a wine collection. Today, cellars are also being built for the enjoyment of the owners," Zuehl says. "When people are this passionate about wine, there is no limit to how creative a wine cellar can get." Dr. John and Joanne Bomhoff (above) wanted a cave but lacked the hillside. An area of the couple’s unfinished basement was transformed into a cellar (top) that gives the impression of being underneath the earth. Larry Grunewald is a cave man, and he's not ashamed to admit it. Back in 2000, he and his wife, Jean, visited the winery caves at Far Niente and Araujo in Napa Valley and were amazed by what they saw. As Grunewald's wine collection grew in the ensuing years, so did an idea that he had: Rather than build a traditional cellar, why not dig his own wine cave—a place to cellar and enjoy his collection in style? He consulted the man who built the Araujo and Far Niente caves, Alf Burtleson. "We thought a personal cave was just a wild idea that would be blown off by Alf," says Grunewald. "But talking with him, we discovered that it was not only feasible, it was the more economical option." 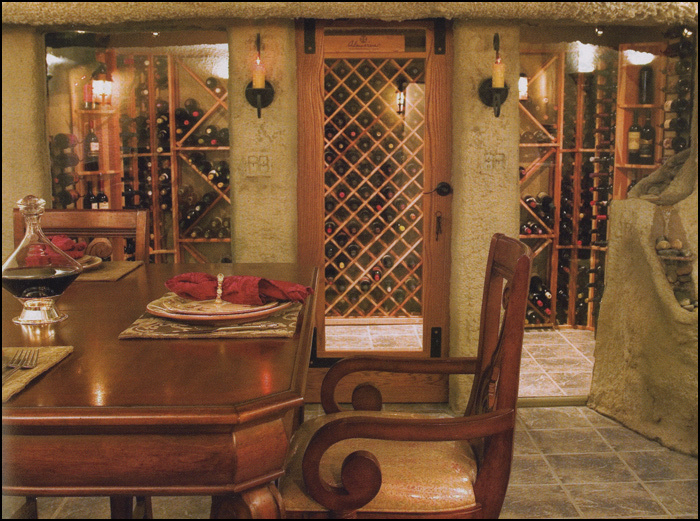 Today, the Grunewalds, who own a bed-and-breakfast in the hills above Oakville, Calif., keep their wine in a 1,200-square-foot cavern, which Larry has dubbed Palm Corner. Elements of Araujo's cave were incorporated into the Grunewald design, including wooden entry doors, wall sconces and a section of naturally occurring basalt rock left uncovered. Empty wine barrels line the main entry shaft, which leads to the dining area and then the focal point unearthed rock, flanked by chambers for cellaring and serving. The cellaring chamber houses the Grunewalds' collection of 2,400 bottles, including a 3-liter Silver Oak Cabernet Sauvignon Napa Valley 1994 signed by the late owner and winemaker Justin Meyer, numerous verticals of California Cabernet and Pinot Noir, and a 3.75-liter bottle of Château d'Yquem 1988. Yes, once thought to be extinct, it turns out that cave men are alive today—and living very well. But unlike those hairy prehistoric hulks with wooden clubs, today's cave men are affluent professionals who sip vintage Cabernet in swank, subterranean cellars. Inspired by visits to winery caves, these collectors are deciding that custom-built caverns offer the best atmosphere for storing and enjoying wine. Because caves naturally provide the perfect conditions for cellaring—constant, cool temperatures, high humidity and an utter lack of sunlight—winemakers have been storing wine underground for millennia. Wine in an oak barrel evaporates much more slowly in a damp cave than in a dry warehouse. Despite the lack of a climate-control system, the Grunewalds' cave is dark and humid, its custom-built mahogany doors preserving temperatures in the 55° F to 60° F range and humidity at 70 percent to 75 percent. European wineries have taken advantage of natural caves for centuries, sometimes expanding them for their needs. In 1870, Napa Valley's Jacob Schram hired Chinese laborers who had dug tunnels for the railroads to dig a cave for his young Schramsberg Vineyards. Beringer Vineyards hired its own crew to excavate a 1,200-foot-long cave around the same time. No one dug any new California wine caves in the 20th century until 1981, when Far Niente hired Burtleson to create its cellars. That triggered a new wave of digging (see "Napa Valley Wine Caves," Dec. 31, 2002), as winery owners learned that modern technologies had made it cheaper to tunnel a cave than to erect a climate-controlled warehouse. Wealthy collectors, enamored with the romance of wineries' underground cellars, soon realized they could have their own wine hideaways. David Provost of Bacchus Caves in Napa says half the caves he digs these days are for collectors. Some of Provost's clients find their inspiration in the old wine caves of Europe. A visit to the cellar cave of Château de Marçay, a Relais & Châteaux hotel in France's Loire Valley, provided Vito Bialla with his. He left with not only the cellar's five remaining bottles of Groth Cabernet Sauvignon Napa Valley 1985, but also the firm belief that every man needs a cave. He envisioned his own dug into his hillside property. "Vito knew exactly what he wanted and had already designed the cave himself when he first contacted me," recalls Provost, who has been building winery caves for more than a decade. "He even knew where he wanted to tunnel and had put an 'X' on the hillside." That hill is located on 23 acres, perched 1,700 feet above the Napa Valley floor in Atlas Peak. Bialla and his wife, Linda, bought the property as a weekend escape from his executive search and management consulting firm in Sausalito, Calif. Today, Bialla's cave is located 50 feet from his farmhouse. The 2,000-square-foot, copper-sconce-lit cave has four separate chambers and three differing ceiling heights, ranging from 12.5 feet in the outer chamber to 6 feet in the dining niche—just tall enough to accommodate Bialla's height. The outer chamber holds empty wine barrels and leads to a massive stone archway with two iron doors opening to the main chamber. Here, pairs of iron doors lead to chambers where Bialla cellars his private stash of 2,200 bottles on iron racks. Caymus Cabernet Sauvignon Napa Valley Special Selection 2002, Opus One Napa Valley 2002, 2001 and 2000, Dominari Cabernet Sauvignon Napa Valley 2002 and Elan Cabernet Sauvignon Atlas Peak 2002 are among the stash, with room left for 300 more bottles. Encompassing the end of the cavern is a plaster-finished, cocoonlike room, lit by candles and with the capacity to seat up to 14 guests comfortably on a cushioned, encircling banquette. "The cave is an escape and my sanctuary," Bialla says. "I go down there and say, 'What little treat shall Linda and I share with our friends tonight?'" Unlike most personal caves, this one was built to winery specifications, which allows Bialla the option of turning it into a working winery. "It has one portal in and one portal out, a sprinkler system, process waste drains, hot- and cold-water stations, a compressed-air station and an inert gas line, and it maintains a constant temperature of 58° F and 65 percent humidity naturally," Provost notes. "Vito could make wine in his cave." Constructing a cave may seem like an ambitious and extravagant undertaking. Yet for those with hillside property, it can be more practical than building a traditional cellar. Waterproofing and climate control are built in. And ongoing maintenance is only a matter of keeping the doors varnished, their hinges greased and informing the contractor of any water leaks. Collectors in Napa and Sonoma counties find the permit process shorter and construction expenses lower, living in localities where caves are embraced and where experienced, efficient cave contractors do most of their business. Many other counties, including some in California, offer building permits, not cave permits, and do not know how to address a request for a cave permit. "It may be seen as a prototype for future caves, which can slow things down. Sometimes its newness makes it an easy process. It just depends on the municipality," Provost says. "But construction costs for a basic cave are usually less than for architecture, no matter the locality, and the maintenance is minimal." Nevertheless, the construction of a cave is not a do-it-yourself project. "These are not little holes in the ground," says Jim Curry, president of Alf Burtleson Construction, located in St. Helena, Calif. (Burtleson sold his company to Curry and retired in 2002.) "You can't just go into the backyard and start digging into the side of a hill. These are engineered structures requiring professional tunneling contractors." Unlike the laborers of the 19th century, who used picks and shovels, today's miners break ground with modern tunneling equipment that's guided by lasers. An example of this equipment is the roadheader, which resembles a tank with an extended motorized arm and a carbide-tipped cone of spikes. It cuts and tunnels through the earth, loading the muck—excavated earth, clay and rocks—onto its apron with two loading arms and transporting the material to its rear side. The muck is then removed from the tunnel with underground trucks or muckers, machines similar to an aboveground loader. As they dig, the miners support the new tunnel walls with shotcrete, a concretelike mixture applied wet from a compressed-air hose. "Each day we dig as far as Mother Nature allows us and cover it up with shotcrete," says Provost. This process of tunneling and applying shotcrete is repeated over and over until the excavation is complete. Waterproofing, wiring and plumbing are then installed, followed by a final coat of shotcrete, before the drains, floors, final electrical and custom-made doors are installed. How much does all this cost? A basic cave can be built for $150 per square foot. Of course, that's for just the basics: structure, flooring and utilities; doors, lighting and racking are not included in that price. The Grunewalds' custom-built doors cost an additional $10,000. Many collectors also opt for handcrafted lighting, custom racking and surround-sound systems, which propel the final price tag much higher, sometimes as high as $1 million, according to Provost. But some collectors find that being able to create a personal retreat is well worth the money. George Bull, who is CEO of Redwood Trust, views his cave as a destination, just steps across the limestone courtyard from the Santa Rosa, Calif., home that he shares with his wife, Sue. After cutting the house into the hillside, a wall was needed to retain the earth, which had been cut away and pushed back from the house and courtyard area. But as construction began on the retaining wall, Bull became concerned about its size. "With the future wall in direct view of my front door, I asked my builder, Michael Cello of Cello and Maudru Construction [in Napa], how big it was going to be. Mike said, 'Pretty big,'" Bull recounts. "I'd just returned from Bill Harlan's cave, so I asked Mike about the possibility of digging into the space to build a cave." After finding out that this was possible, Bull contracted Tom Taylor of Taylor Lombardo Architects in San Francisco to come up with a design. But the equipment used in cave construction requires a lot of space, and the house was in the way. Don Magorian of Magorian Mine Services in Auburn, Calif., had to literally work around the house to tunnel through the hill. The hillside directly behind the portal was too flat to provide a sufficent amount of earth over the cave, so the entry was curved into a deeper part of the hill. "The area was a little tight, and we were working in rainy winter months to meet the Bulls' time frame," Magorian recalls. With the cave still under construction, the Bulls moved into the house. "Looking out the window was like looking onto a battlefield," George says. By the summer, the muddy view had been replaced by a curved, asymmetrical portal cased in limestone. Only one year after that, the facade of Bull's cave looked like something from the Old World. "Walking from the house across the limestone courtyard to the cave adds a heightened sense of arrival," Taylor says. Massive double doors of reclaimed teak with speakeasy windows open to a 500-square-foot domed cave, complete with refrigerator, dishwasher, telephone and stereo. Terra-cotta wine racks with the capacity for 1,500 bottles house mini-verticals such as Marcassin Pinot Noir Sonoma Coast 1999 to 2002, Harlan Estate Napa Valley 1999 to 2001 and Rudd Cabernet Sauvignon Oakville 2001 and 2002. The cave is the setting for many of the Bulls' parties and dinners, but ultimately it is "the man's cave." Here, Bull hangs out with his wine buddies, smoking Fuente Fuente OpusX cigars, playing cards and expressing themselves freely at the expense of polite conversation. "It is a cave rule that if women enter, they can't complain about our behavior," Bull laughs. Bull's cave also provides him with quiet solitude. "Some of my favorite moments are spent alone in the cave, just rearranging my wine," he says. Jan Walsh is a freelance writer based in Vestavia Hills, Ala. She began writing for Wine Spectator in 2005. If you are interested in purchasing reprints of this or other recent articles, please contact the Reprint Department at reprints@mshanken.com.